To help with those who are trying to figure out what they are going to do for tutoring this year or teaching your own kids at home, I hope this dig out of the archives will help! Below is my Top 20! These are some of my tried and true methods I've used at home and as a Tutor that are guaranteed to be fun, silly and engaging for your kids or students - so give some a try! Bear in mind that some of these will work for younger kids verses older kids and some ideas work for the classroom setting verses home - you decide! Silly Balls! This is my number one requested prop - bar none - across all ages and classes! Kids ask for these without fail weekly! 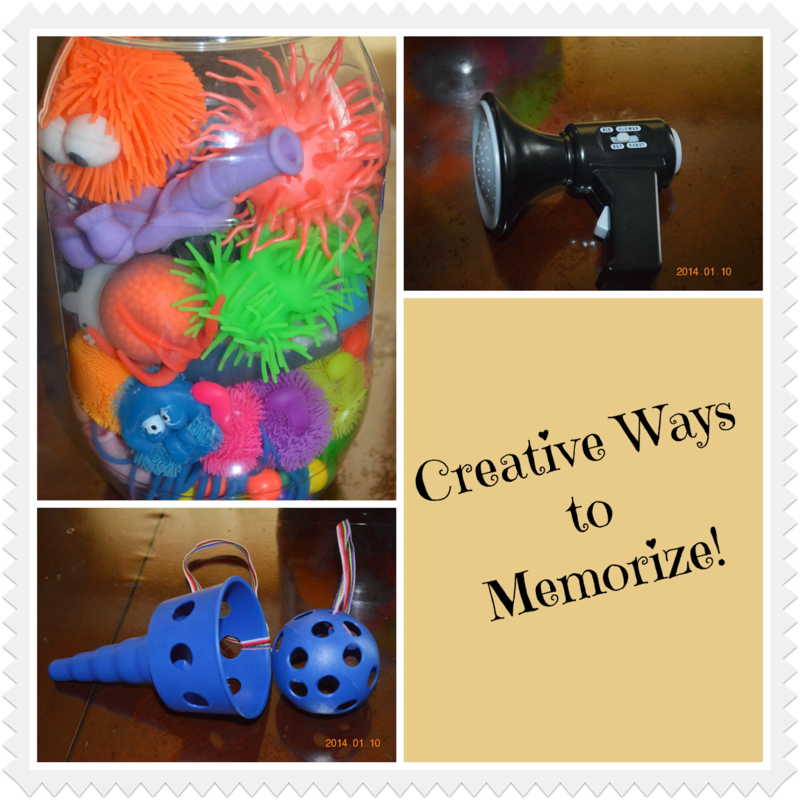 Here's how I use them: Reach in your container and grab a random silly ball from your pile and throw it to a student, asking them to recite the memory work you are working on, while they squish, squeeze and pull. They recite it and then throw it back to you. Repeat until all the kids have had a turn reciting and squishing, squeezing and playing! Voice Changers! Pick up some voice changing microphones. I have a bull horn that switches to different voices and an elf voice microphone. Kids love to hear their voice changed to silly sounding voices. Let them recite and pass it around as they do to take turns. Ball in Cup! You know those cups on a stick with a ball attached to them? Well, now you have a good use for them! Have the kids recite while trying to get the ball into the cup. That was Easy Button! Grab some Staples "That was easy" buttons or any button saying something silly. I have ones that say "whatever" and "you're awesome". Have the child recite the information and then you hold out the button for them to hit it and hear "That was easy!". Hot and Cold! Send a person out of the room and hide the piece of memory work (either written on an index card or a flash card etc.). When they return have the remaining children who know where it's hidden, all recite the information, singing or saying it louder as the child gets closer to the hidden object and softer as they get further away. Once the card is found then send another student out and hide it again and repeat. Silly Cubes! Using cardstock paper for the cube page, print this out and cut it and fold the cube, gluing it to stay in place. Then you can cut out the faces and headings to glue on each cube side. There is one for each side. Once everything is glued and in place, use clear packaging tape to give it a sturdy kid proof finish. Then you can have the kids roll it like a dice and do whatever action or voice it says - they like the pictures/animals a lot. There are other cubes like this out in cyberspace if you just google. Girl Band/Boy Band! Using echo microphones have two teams form. They become two bands. Have the bands come up and sing their memory work in their best song. Works well for the CC History songs. Headbandz! Use those headbands from the game Headbandz and put flash cards in them (works well for timeline). Have the kids put themselves in order (works well for a CC type class) or have them guess which flash card they have based on asking questions (works good at home when you have more time). History Walk! Want your kids to remember some key events in history? Great! Then do a history walk. Print out rebus' for them or flashcards of the information about history you want them to remember and then have them walk from print out to print out around the room reciting the information as they go. You can even scatter them around the room and have them figure out which one they need to go to in which timeline order and recite them. Hat Heads! Using dress up hats such as chinese cooley hat, cowboy hat, sombrero, fancy tea hat, army hat, king hat, clown hat etc. whatever you have. The kids pick a hat and say their memory work in that accent or voice. Stair Fall! Have them start at the top of the stairs and then as they recite the asked information correctly they get to move down the steps. First one to make it to the bottom wins a prize or has a treat waiting for them when they finally arrive! Healthy marshmallows is our favorite treat! Emotional Wreck! Have each child come up with some sort of emotion to recite their memory work while acting that emotion out, go around the room as they take turns acting and reciting for one another. Emotions like crying, laughing, being angry, happy, hysterical (I let them even do valley girl although it's not an "emotion" -it's popular with the girls) - you get the idea - whatever they want to do. Also works well at home to be really silly as a family. Leader Change! The kids form a line and pick a starting point, then the leader picks an action to do as they begin to walk around the room (hop, skip, leap, walk backwards, sideways, crawl etc.) doing that action and recite. When they get to the starting point again, the leader runs to the back and the next person in line picks a new action and leads them around the room as they recite. They keep switching until everyone has had a turn to lead. Hide and Seek Facts! Hide parts of a sentence or groupings of information, individually, around the room. Have them seek for the parts to make the whole and put them together in correct order. Rockettes! Kids line up and put arms around one another's shoulders or waists, to form a cancan line. They then recite while dancing alternating their kicks coordinating them together. Girls like this and it gets very silly! Walk Don't Run! As they walk briskly around the room (but they can't run), have them recite their information calling out voice volume commands (loud, soft, whisper, louder etc.) they must continue to briskly walk. Anyone who doesn't change voice volume, stops singing/reciting as they walk or breaks into a run - has to sing/say it solo in front of everyone or do push ups (or whatever you want to make the silly consequence)! Make Up Your Own Motions! You don't need an official hand motion for any memory work you have and it doesn't even have to be restricted to your hands. I find that the ones we have made up ourselves are the most memorable and stick the best because the kids make up things that are intuitive to them. I will often read the list and then go through them one at a time and have them throw out ideas for what they think of. If they get stumped, I give an idea. Kids agree on what is best and then move forward with the next piece of information. For example my daughter made up the motions for remembering a pint and she said it sounded like "punt" so to remember it she used the motion of kicking a punt in football - whatever works! Hop Scotch! Using blue tape, tape out a hopscotch board. Have the kids take turnings hopping through while reciting their memory work. Strike-A-Pose! Using your iPad's photo-booth app - have each child recite a piece of memory work and then you take a picture of them using one of the photobooth selections (this app makes pictures very silly by stretching, twirling, squeezing, x-ray, light tunnel, twirling and other picture warping features). Don't let them see it. Keep going one by one and taking a picture as they each recite - choosing different ways to warp the picture for each child. Then when they've all recited, do a silly faces slide show of all of them. They find this very, very funny! Memory Mogul! It's a favorite and you can download with directions on how to play it from my website for FREE. In essence it's played with memory work and $ and a bunch of funny cards that the kids read out loud in response to their correct or in-correct answers. The cards say silly things and give directions to either take or give money to other players or the bank. You can get everything right and still loose - so it evens the playing field when players of different levels compete. Duck Duck Goose! Have the kids sit in a circle and one child begins by walking around the outside reciting the memory work. When they get to the last word then the person they touch gets up and chases them to try and tag them before they make it to their seat first. Then the game continues with that person and so on. Shamrock Showdown! Great for younger kids - teaches place value while doing memory work. This is what I use to play the game HERE. The way I use it is to have the kids break into two teams and then ask a question of one team, they draw a number from the coins (put them in a jar or something they can't see the number they are drawing). Once they draw a number as a team they decide where to place it on the board. The next team goes and does the same after they answer correctly. They too decide where to put the number on the board. The team to get the highest number wins that round. We keep score and the team that has the most points from rounds won is the winner of the game. Kids actually like this a lot in the younger ages (6-9 years) and it helps teach place value at the ams time. Human Tic-Tac Toe! Three rows of three chairs each. Two teams and have them compete with one another to place people on the board to get three in a row. Team player who answers must be the one to sit if correct. If incorrect the opposing team can steal and then pick whomever they want from their team to sit (usually the weakest link). Red Rover, Red Rover! Great game for outside on a nice day! Two teams, holding hands creating a human "chain". A question is asked or piece of memorization requested and when the team gets a correct answer they get to call a person from the other team of their choice to come over. That person runs and tries to break through the human "chain". If they are "captured" they remain on the team. Don't Wake Daddy! Using the game Don't Wake Daddy HERE. Have the kids say their memory work and each correct turn they get to push the button one time. They take turns and keep going until someone pushes it and the Daddy wakes up. That person is out of the game and it continues until each person has gone - last one to survive wins. Crocodile Dentist! HERE. I divide the class into two teams and each team goes back and forth answering a review question, one person on the team at a time. If that person gets it right for their team then they can push down a tooth - if the crocodile doesn't slam shut they get to keep the point. If the crocodile closes his mouth then he "ate" their team's point and none is given. If the person on the team can't answer the question, then the other team can steal. Play resumes after point awarded to steeling team -if correct and the crocodile doesn't eat it! CC Tutor Tip: I look at all these things above as "frameworks" that I can put any memory work on. It makes preparing each week to teach much easier because I know what my "frameworks" are and I just move around the order and subjects they are used for and bring in and out different ones each semester. Sometimes I even let the kids decide which prop we will use by giving them a few choices of what I have in my box (which they really like to do). I also use more basics like chanting, singing, erasing the board progressively and other non-prop dependent methods to get through the 30 minute segment in time. However, adding some of the above ideas for say three or four out of the 7 areas we cover, throws some fun into the mix for the kids and keeps them fully engaged. I hope these help make some Tutors, Moms and kids out there - enjoy the Grammar Stage even more! These are so wonderful and DOABLE! Thankyou! I am so glad they help! Have a blessed school year! I remember this post from before! It takes a whole new meaning now that I'm in CC this year, though =) Thanks! Yes! I thought it might! Hopefully, it will bless you this year. Thanks for stopping by! The Silly cubes link to print for #6 is broken. Amazing, fun, and helpful. Thank you Thank you! awesome! thanks so much, from one tutor to another I love these fresh ideas!